Other than being delicious, this particular cake (that we adapted from Balthazar in New York) and like most great recipes, comes with a comical memory. The first time I tasted this was with Rio (of rio’s marinara sauce fame) when we were in the Big Apple causing trouble attending a hair show. Now, Rio isn’t the best at holding her liquor. We remain friends in spite of this. So after our amazing dinner and her ONE cocktail, the rest of us on the trip were in for a few more, but she was completely tanked done for the evening. So, as we enjoyed our post-dinner nightcaps, we had, somewhat carelessly, sent a 5’1″ little nugget loose in SoHo to wander her way back to our hotel across town. Luckily, she found her way and as a thank you for being such a great caretaker, she bought me a copy of the Balthazar cookbook. 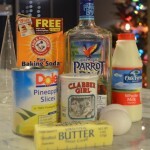 Sift together flour, baking soda, baking powder and salt in a bowl and set aside. 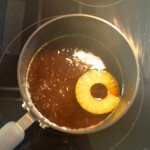 In a small saucepan over medium-high heat, combine the brown sugar, vanilla, 1 pineapple ring and 1 teaspoon of canned pineapple juice with 1 cup of water. 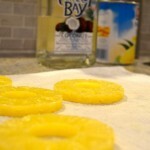 After 10 minutes, discard the pineapple and increase heat to high. Cook until the liquid reduced to about 1/3 cup, about 10 more minutes, stirring occasionally. Remove saucepan from heat, add rum and set aside. Meanwhile, in the bowl of a standing mixer (or using a handheld electric mixer), cream the sugar and butter on medium speed until smooth and fluffy. 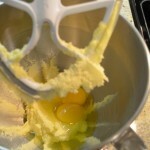 Add the eggs and beat together until well-combined. 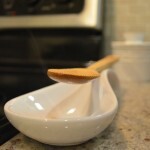 Add the sifted, dry ingredients and beat on low for 10 seconds. Slowly add the milk and beat on low until the mixture appears smooth. Set aside. 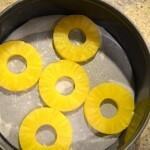 Arrange pineapple slices in the bottom of a well-greased 9″ round cake pan. To be better safe than sorry, I always use parchment paper for any flipping action cakes. And obviously you can use more than 5 rings if space allows, you just see what we’re doing here with the 5 golden rings and all. Pour enough of the reduced syrup in the pan to coat the bottom. Reserve the rest. Spoon batter over the pineapples and syrup and smooth. Bake for 30-35 minutes, rotating halfway though. 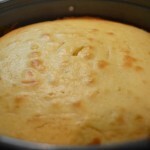 Let the cake cool for about 5 minutes before awesomely and impressively turning cake over onto your serving plate. 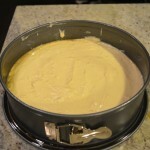 Drizzle remaining glaze over the top of the cooled cake. 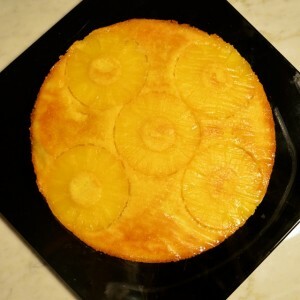 One Response to "five golden rings: pineapple upside-down cake"
Thank you thank you thank you for leaving off the usual marischino cherries in the middle of the rings. The only place those things belong is on top of a sundae or in the bottom of an old fashioned.